Oak Ka Ba La, the son of king San Da Thu Dam Ma, ascended the throne of Mraukoo in AD 1674. After he had reigned the country for eleven years, he built a pagoda near Mingalar gate in the north of the palace. The king named the pagoda Mingalamanaung in order to know that Rakhine people complied with thirty eight kinds of blessing from generation to generation successfully. At the same time, Mingalaoo pagoda was also built in the old capital of Crake. One day, after the king had made obeisance to Mahamuni Buddha image, the courtier told the king in supplication on the way back to Mraukoo that Mingalaoo pagoda collapsed occasionally. And then, the king ordered his companions to go back to Mraukoo and he set off for the old capital of Crake with his two queens by the single boat. When the comrade Thi Ha who governed the southern part heard such news, he advanced towards the old capital of Crake to assassinate him. When king Oak Ka Ba La got to the port of the old Crake city, he disembarked from the boat, but the comrade Thi Ha assassinated him with his spear, therefore, the king passed away. Mingalamanaung and Mingalaoo pagodas remained unfinished, but king Wa Ra Dam Ma, the successive king of king Oak Ka Ba La, completed building those pagodas. 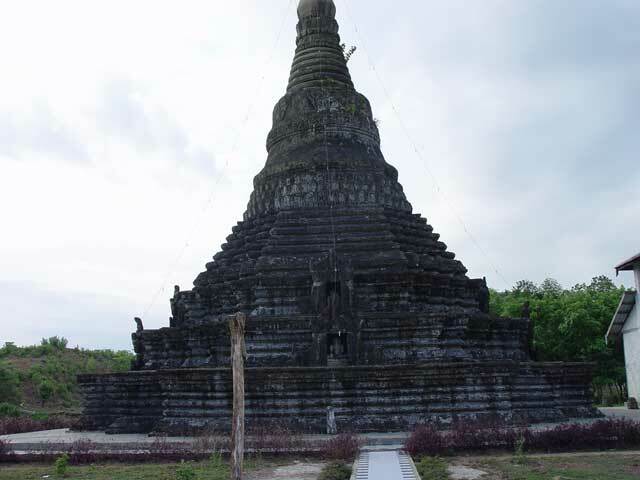 The pagoda is the conical solid structure and it was only made of stone. The pagoda is enclosed with the stone wall. There are the stairways and the entrances at four facades of the wall. The two terraces of the pagoda have eight porches in which the stone Buddha images were placed. Only after U Thar Tun Oo from Warzay quarter had ordained and renounced the world near the pagoda, the forest was cleared and the ruinous pagoda was repaired. The leader of repairing the pagoda, was Layman devotee Maung Shwe Pyot. The statue of monk Dam Ma Pi Ya which was made of cement, was erected in the place of his dwelling as a commemoration. When the pagoda was repaired, the masons didn’t use the original stone sculptures for decorations of the porch. Instead, they discarded them around the pagoda and the decorations of the porch were made of only cement which was more convenient. There are big stone pillars to light the open oil lamps around the four directions. The ordination hall is in the east of the pagoda. Nowadays, the Buddha images in the ordination hall are the images which were shifted from the hill which is half a mile away from Mingalamanaung pagoda. The single-palace image donated by king Thi Ri Thu Dam Ma and queen Nat Shin May in 1638 AD, is near Mingalamanaung monastery. That Buddha image which was made of stone, is 7 feet high. The throne with the stone sculptures, is splendid. The figures of male and female from the four continents, can be seen standing side by side at the four directions of the prayer hall of the Buddha image. The board of trustee of the pagoda maintains the pagoda.